In February 2000, G. A. Beller formed ECI Investment Advisors, Inc. (ECI) as a privately held commercial real estate company providing municipalities, financial institutions, Real Estate Investment Trusts, and private investors with investment, development, and advisory services. Beller was a senior executive of one of the largest publicly traded Real Estate Investment Trusts (REITS) in the U.S., headed by its chairman, billionaire investor Sam Zell. Beller was involved with Mr. Zell for over ten years in numerous companies, ventures, and large real estate transactions. Prior to joining the Zell organization in 1989, Beller was the Managing General Partner of a private equity firm investing in and offering financial services to a diverse base of commercial businesses in retail, food services, and technology, as well as construction and real estate related entities. Upon the formation of ECI, Beller enlisted two of his most trusted colleagues from the Zell organization to join ECI: Mike Mattenson and Keith Bawolek. In addition to their institutional clients, the ECI team continued to provide advisory services to Zell related entities until 2008. ECI’s broad financial investment and real estate expertise allows ECI to act as an investor, developer, and financial advisor. ECI formed G. Anton Companies (GAC) to consolidate the management and financial oversight for all of ECI's investments in the arts and entertainment. GAC provides financial resources and business strategies for the development of novels, movies, television, and digital media content. GAC is a wholly owned subsidiary of ECI. A pipeline of projects have been identified through GAC's various entities, which will be funded, published, and produced as significant investment priorities of ECI investment Advisors, Inc. In 2013, ECI established GABE Advisors, LLC (GABE) for the purpose of entering the book publishing industry. GABE began by creating and trademarking Defining KarmaTM as a creative writing grant program for aspiring and established authors. G. Anton Companies is responsible for capital investment decisions relating to G. Anton Publishing, G. Anton Productions, and G. Anton, LLC, as well as providing management oversight for GABE Advisors, LLC. In 2003, ECI formed ECI Development Services, LLC (EDS), and recruited two senior executives from Chicago-based REIT, Urban Shopping Centers, Inc. (NYSE:URB), and JMB Realty to lead the company. Headquarters were established in Richmond, VA. EDS is responsible for design and implementation of urban redevelopment master plans. EDS also provides third-party real estate development, management, and ownership representation services. ECI also has extensive experience in urban redevelopment, including structuring public/private partnerships with municipalities, airports, sports arenas, and convention centers. City of Richmond—In 2003, ECI master planned and provided financial and development services to the City of Richmond, Virginia. The City of Richmond project initially included The Broad Street Community Development Authority (CDA), which was the largest urban CDA of its time in the country. 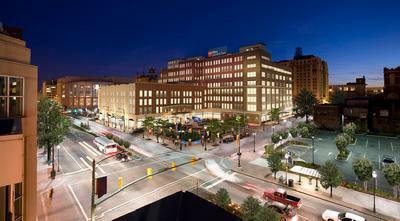 The initial master plan provided ECI with a challenging mixed-use national historic renovation project. In 2007, ECI converted the former Miller & Rhoads department store building into a mixed-use project; anchored by a new Hilton branded hotel with a residential and retail component. The entire mixed-use project was approximately 500,000 square feet. For its uniqueness, this project won high praise and a number of industry-recognized awards. ECI has invested in airport parking companies, including ownership and operations of the parking facilities at T.F. Green Airport in Providence, Rhode Island, which ownership interest was sold in 2004. Since its inception, ECI has participated in excess of a billion dollars in financial and real estate projects. ECI has been providing parking operations asset management and consulting services since its formation. ECI's unique parking expertise has been utilized by some of the largest institutions in the country, including airports, municipalities, REITS, and private equity firms to maximize their profits from parking operations. ECI Capital Partners (ECP) is based in Chicago and acts as the investment and advisory affiliate of ECI, primarily focused on identifying investment opportunities and providing specialized advisory services.